I have a 1971 Mustang Mach 1. It is an M code. The internet says that the engine it is a Cobra Jet. My question is did Ford build a 351 cobra jet V8 and was it available in the 71 Mach 1 ? Yes, there were available 1971 Mustang Cobra Jet engines. For full details on all of the options and engine choices for the 1971 Mach l you might want to check out the 1971 Mustang section. In fact, not only was there an available Cobrajet engine, there were four different kinds. Two of these were 351 V8's and the other two were big block motors. According to the 197 Mustang specs, your M code 1971 Mustang Mach 1 has a 351 cubic inch V8 with a 4 barrel carburetor and did not have the ram air option (these cars would be a ' Q code ' car ). Advertised horsepower on the M code is 285 horsepower, with the 10.7:1 compression ratio on premium fuel. 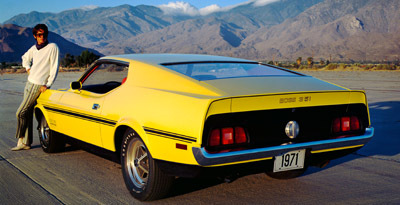 I've included a picture of a 1971 Mach 1, but why don't you send us some pics of your ride and we'll feature them instead?